If you live in the Seattle area, chances are you fly in and out of Seattle-Tacoma International Airport several times a year. But Sea-Tac (the airport's nickname) is also a major hub for West Coast and international travel, resulting in layovers for many connecting flights. Whether you're a local or a visitor passing through on route to your final destination, this airport's amenities will keep you occupied. From perusing artwork and eating local fare to shopping at high-end boutiques and indulging in a chair massage, your layover at Sea-Tac can be almost as much of a vacation experience as the vacation itself. Sea-Tac Airport’s Central Terminal received major upgrades in the mid-2000s adding to both the airport's aesthetic and comfort appeal. The layout is open and bright, with a wall of windows along one side, making it a great place to watch the planes land and take off (especially for kids). 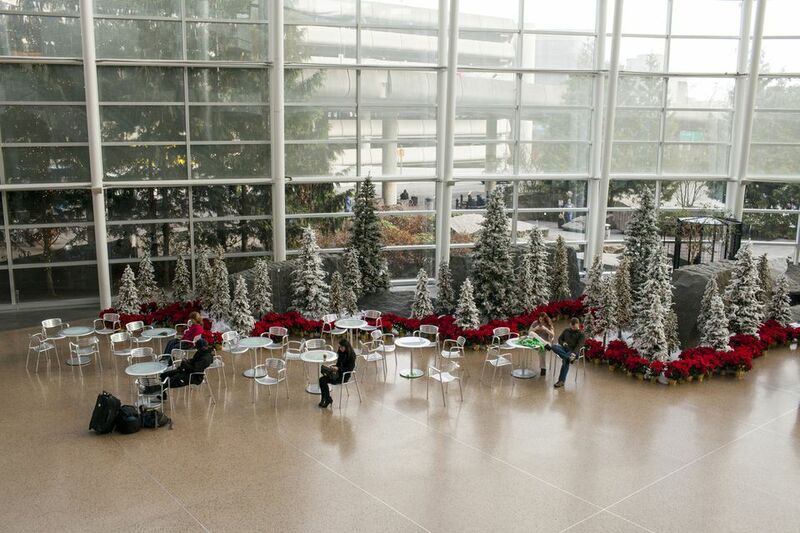 Free Wi-Fi is available throughout the terminal if you need to get work done or research your final destination. Or if you just want to unplug and relax, pull up a rocking chair alongside the wall of windows and sneak in a nap. The upgrade to Sea-Tac's Central Terminal also made it a great place to shop. Unique standalone shops are interspersed among typical airport bookstores and duty-free venues. Fireworks, situated in the main terminal, offers artistic jewelry, gifts, decor, and novelties, many of which are made by local artists. Outdoorsmen and women will love Ex Officio as a one-stop-shop for travel clothing and accessories (need a shirt with SPF?). Other airport shops include a high-end MAC makeup boutique, Planewear, which houses everything aviation, and Sub Pop, named after its corresponding Seattle-based record label. Sea-Tac's food court offers fast food options like McDonald's, Qdoba Grill, and Sbarro pizza and pasta. But for a true foodie, the airport is home to many fabulous restaurants and lounges where you can sample local fare. Try Anthony’s Restaurant and Fish Bar for fresh-out-of-the-Puget-Sound fish and shellfish. Rel’Lish Burger Lounge offers upscale burgers and signature cocktails. And Vino Volo, a wine bar chain, sources local wines and serves small plates. Art lovers will enjoy Central Terminal's huge hanging mobile created by artists Ralph Helmick and Stuart Schechter. Look closely and you’ll see that each element of the mobile is a tiny figure of its own. Then, step away from the ceiling's decoration to reveal a bird landing on the water. Glass, sculptures, photography, and paintings line almost every terminal. But Concourse B has some of the coolest artwork of all, and it's right below your feet. Within the terminal's floor lies bronze fish embedded in terrazzo and created by artists Judith Caldwell and Daniel Caldwell. Many people rush past this site without giving it a second look. If you're just passing through and won't get to experience downtown Seattle, Sea-Tac actually offers you a glimpse of the city's best local businesses. Beecher’s Handmade Cheese—makers of flagship cheeses that contain locally-sourced ingredients—has a sandwich shop in Concourse C. If you haven’t sampled Beecher’s cheeses (in their Seattle or New York City Shop), a two-hour layover makes it the perfect time to do so. Alki Bakery in Central Terminal offers a host of local wines. And the airport's Made in Washington store sells locally-made artisan gifts alongside Pacific Northwest smoked salmon and other specialty food items. And, of course, around every corner sits a Starbucks or a Seattle’s Best coffee joint. Sure, some people walk the mall for exercise. But when you find yourself with a long layover, walking the airport can be even better. All of the terminals at Sea-Tac are connected, and if you get there early before the crowds, terminal exploring is a great way to sneak in some exercise. Concourses A, B, C, and D all branch off of Central Terminal and the South and North Satellites connect via a short underground train ride. Get the feel for the old airport in Concourse B (an area with fewer restaurants), and then compare that to the newer amenities offered in Concourses A and C.
In typical Seattle style, massage chairs are stationed throughout the airport, ready to give you a quick dose of relaxation. But if you want something a little more personal, Massage Bar, located in the North Satellite, provides seated massages, using petrissage, compression, and deep tissue techniques. The spa also provides heat therapy treatments that incorporate warm flax-seed wraps placed on the neck and shoulders to relax tired muscles. And if you just need a quickie, order up a foot massage. Live music at an airport? Only in Seattle...with live performances scheduled seven days a week throughout the terminal, Sea-Tac has a way of treating passengers right. Check the schedule to see what time and in what location local acts are playing, and then wander on by before you board your plane. Frequent flyers can enjoy their carrier's airport lounge during a long layover at Sea-Tac. And those without specific airline privileges can buy a day pass to Delta's Sky Club, Alaska Lounge, United Club, and the Club at SEA. Once inside, enjoy high-speed Wi-Fi, large screen TVs, great cell phone reception, all-you-can-eat gourmet snacks, an open bar, and on-hand airline staff for reservations assistance. Guests and family members can tag along, too. Just make sure to abide by the house rules, as lounges are meant to be peaceful and luxurious.